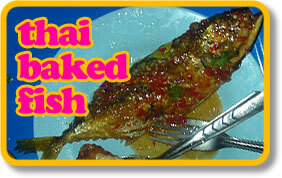 I ate this in a night market in a place called Trat in Thailand. I’d just suffered an eight hour bus journey and would have eaten my luggage if neccessary. I was way overcharged by a wrinkly old woman who just made up a price out of thin air, but I was so hungry I didn’t care. It was still ridiculously cheap. And ridiculously tasty. Give this a try, you’ll love it. Combine all the marinade ingredients in a large plastic bag. Add the fish and coat well. Seal the bag and marinade the fish for at least an hour in the fridge. Preheat the oven to 180ºC. Pour out the fish and marinade into a baking tray, cover with foil and cook in the oven for roughly 20 minutes (depending on the size of your fish), turning occasionally or until the fish is just cooked through. Remove the fish from the tray and place under a hot grill until it crispens up and browns on each side before serving. Garnish generously with chopped spring onions, fresh coriander, chopped fresh tomato, slices of hot chilli and wedges of lime to squeeze over. Serve hot or cold with boiled rice. I am salivating as I type this.